Low Stress Handling® University is the one stop shop for Companion Animal Professionals like you to be able to find the classes you need to help you better serve your clients, increase business and/or lower worker’s compensation costs. 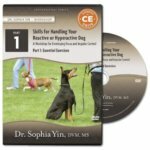 Here you will find all the classes that were offered at DrSophiaYin.com and more. If you are a current or prior student of our programs, you should have received an email somewhere around June 9th 2017 giving you your new log in information. Alumni of the Low Stress Handling® Silver Certification course will be able to review course videos, and those of you who are currently enrolled in the ProProfs version can log in below and complete the course.